Harajuku duo sporting eclectic and monochrome streetwear styles while out and about on the street. Harajuku guy in handmade monochromatic street fashion. Japanese student on the street in Harajuku wearing leopard print and faux fur with platform shoes, vintage jewelry, and a Moschino Barbie iPhone case. Harajuku teen group in bold and colorful streetwear outfits while out and about at night. Harajuku duo wearing minimalist street fashion in all black. Harajuku girl in mustard top and wide jeans with illustration bag and white Converse sneakers vs. Harajuku girl with gray sweater, skinny jeans, khaki bag and low Converse sneakers. Harajuku girl in black and white lace top, biker jacket, striped mini skirt, bag and ankle boots. Harajuku girl in a black top, shorts and blazer, with neon clutch and socks. 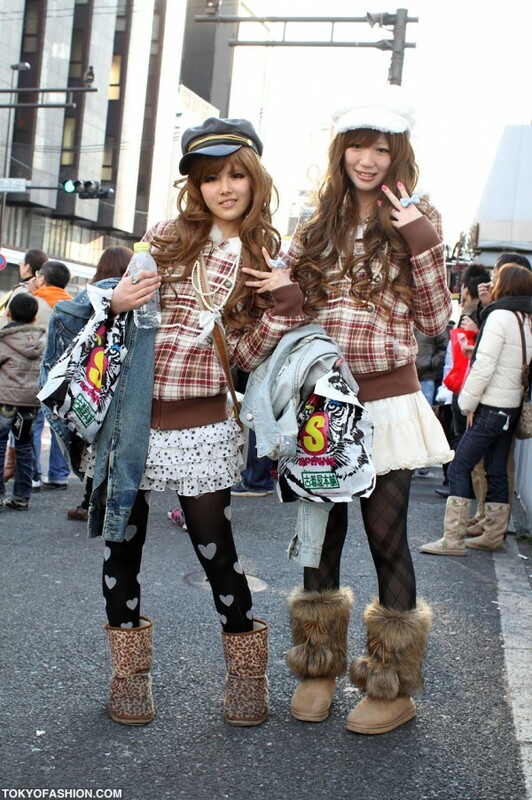 Two cute Japanese girls with matching plaid tops, white miniskirts and hats in Harajuku.